(Los Angeles, CA) - DENK is pleased to announce the opening of Camouflage, the gallery's first solo exhibition of recent works by English-born, Los Angeles-based artist Matthew Anthony Stokes. A self-taught abstract painter, Stokes has cultivated his aesthetic through a unique multi-disciplinary background in performance, corporeal dramaturgy, dance, sculpture, assemblage, film, photography, and poetry. His monochromatic compositions are executed in India ink, vinyl paint, charcoal, and chalk, on raw, unprimed canvas and convey rather than conceal something of the physicality of their materials and application. Seemingly effortless in the ease and concision of their rendering, the works draw from the spontaneity of nature, referencing its landscapes and shifting animate forms. Stokes was a co-founding member of MAQUETTE (1989-1998), an experimental theater and performance art company based initially in Kent, England and later Brussels, Belgium. In collaboration with artists Robert Bennett, Dirk Hendrikx, Guillaume Panneau and Ulrike Koennecke, Stokes cultivated a unique and physically embodied approach to image production and the staging of tableaux, using MAQUETTE as a platform for the activation of ephemeral performative sculpture. The three-dimensional relics of these "unveilings" - objects, costumes, sets, and masks - were all created by the collective and animated through their performances. As inhabitable sculptures and worthy artworks in and of themselves, the objects and environments were brought to life through fleeting periods of physical tenancy. The resulting performances, at times live, were documented through 16 mm or 35 mm film, photographs, and video. Haunting and psychologically evocative, MAQUETTE's penchant for escapist poetics tapped into an alternative reality, one of embodied deliberateness and temporal arrest: a surreal and timeless plane. It also shared something of other art historical and cultural antecedents, like the mythic dramatizations of Joseph Beuys, the sculptural combines of Robert Rauschenberg, and the free association and anti-establishment ethos of DADA and DIY punk. The company, despite its critical acclaim, defected in 1998, at which time Stokes and Hendrikx decided to bury the company's sculptural props and costumes in the Belgian countryside, planning to exhume them in 2020. The symbolic burial and subterranean pause became a fitting physical bookend to MAQUETTE's sculptural and performative oeuvre. Disentombed, their artifacts, films, and photographs will be collectively revisited in the not so distant future. Camouflage will include photographic stills from MAQUETTE's archive, which, when viewed alongside Stokes' paintings, reveal an aesthetic continuity shared by both projects, despite their independence. A material rawness in the current works, evident in the tactility and "lived in" textures of their surfaces, contributes to the feeling of gestural imminence and physical latency; the body is never far from these works. 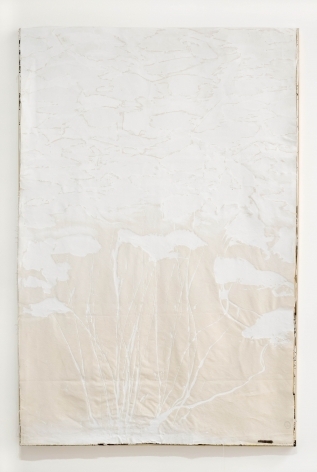 Often painting out of doors, Stokes encourages the traces of nature and time to remain, allowing sediment and dust, for instance, to stay trapped within the paint. Stokes' approach to painting is led by an unfeigned intuitive immersion, offering an avowal of his presence as its maker rather than its disguise. This disarming immediacy evinces something of the performative sculptural legacy of MAQUETTE. Matthew Anthony Stokes was born in Margate, England in 1964, and has been drawing, painting and writing poetry since his early childhood. Following several years in Paris as students of Étienne Decroux (and actors with Theatre de l’Ange Fou – Compagnie Steve Wasson/Corrine Soum) Matthew Anthony Stokes co-founded the MAQUETTE Theatre Company in September 1989 with artists Robert Bennett, Dirk Hendrikx, Guillaume Panneau and Ulrike Koennecke. MAQUETTE was influenced from the outset by Dada; punk; street theater; amateur, poor and ‘outsider’ arts; early film and photoplay; automata - and by ancient and ethnological ‘primitive’ arts. Its experimental body of work took form as a consecutive series of recorded performances, live “unveilings,” texts, drawings, sculptural exhibits, sound recordings and, most important to the collective, an archive of hundreds of outer-stellar photographs and a dozen short films. The work culminated in a series of gallery exhibitions, most notably in the Museum of Modern Art in Gent (SMAK, 1997) and in the Museum of Art in Kortrijk (Belgium 1998). Also in 1998, the silent film Adrift on the Remains of the Grand Piano’ (live musical composition by AKA Moon) was featured as part of the Brussels Festival of Art. In 1999, Stokes returned to England. He went on to study architecture, received his degree from the University of Greenwich and his diploma from the University of Cambridge in 2005. After a couple of years at Foster and Partners in London, Stokes moved to Los Angeles and worked as in-house architectural / furniture designer with Martyn Lawrence Bullard Design. He currently resides in LA and is in-house architectural/furniture designer with Robbin Hayne Architects and WIGWAM Design. Founded in 2017 DENK's mission is to present a diverse program featuring a range of local and international contemporary artists working across a wide range of mediums. The gallery's goal is to curate a series of engaging exhibitions by providing a space that will allow artists the opportunity to develop their own concepts and visions and have them realized. DENK looks to engage the community through multiple platforms, including gallery publications and performances as well as regular talks with artists and curators in the space.